EKC Client News :: Lorena Sarbu Opens Store in Milwaukee! EKC Client Lorena Sarbu and her European-inspired boutique will finally be opening its doors this Thursday in Milwaukee! Already open in Beverly Hills, CA, Lorena Sarbu is a high-end store for women that adds an entirely new kind of class and cosmopolitan to the ever-popular and historic Third Ward. Her take on beauty as well as design is truly revolutionary. Understanding that fashion is the outward expression of an inward beauty, this theme flows through every fiber of her chic and utterly charming shop. From its handmade chandeliers imported from Prague, to the signature Lorena Sarbu colors of radiant red, bold black and glorious gold, you will discover a shopping experience and the most unique pieces by exclusive European designers available. "3rd Ward European Boutique to Open May 28"
EKC Client Dr. Catherine Cardinal To Be A Guest on The Mel Robbins Show! 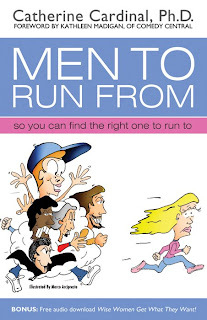 Slated for release this summer, Men to Run From is a witty and compassionate field guide on men that teaches women how to spot the keepers from the throwbacks. Providing needed insight into men and their behaviors, Dr. Cardinal reveals how women can benefit from knowing how to recognize the telltale signs of the different types of men whose behavior only leads to frustration and heartache. As a result, women can learn to make better relationship choices. Dr. Catherine Cardinal, renown psychotherapist with more than 23 years experience and a Los Angeles Times best-selling author. She has been a guest expert on The O’Reilly Factor, Starting Over, Good Day New York, CBS Studio 2, Blind Date, Match.com and Chemistry.com. She has also served as a guest commentator on more than 25 U.S. and international radio programs, and has been featured in Cosmopolitan, Glamour, Redbook, Ladies’ Home Journal, Maxim, Complete Woman, Modern Bride, Star, In Touch and Publishers Weekly. The Mel Robbins Show is a station in Boston that primarily discusses advice and relationships and provides honest and entertaining coaching, storytelling and problem solving. Mel Robbins, the host, focuses on real life problems, personal dramas and conflict to find the right answer for her listeners.The show airs live every Saturday on 96.9 WTKK from 8am -10am EDT, and on Monday thru Friday at 11am-12pm EDT. The show broadcasts in over 20 markets and a live audio stream can be heard on Borders Radio. Also, check out Mel’s blog to get more information about the topics discussed. Featured EKC client PutItOn.com is turning a lot of heads in the art, fashion, music and film industries! Conceived by talented and charming British brothers Greg and Max Fraser, PutItOn.com is a place where budding artists from all over the world can now showcase their work in front of a global audience, connect with other artists and sell their work - for free and with no limitations and with NO commission taken! For the connoisseur, the collector, the devotee, or the newbie who wishes to dive deeper into works of art, music, fashion and film, PutItOn.com provides unlimited access to a world of artists and their works on a scale never before possible, but renders it manageable and approachable through innovative, sophisticated and seamless technological advances, which include accessibility for the deaf and blind. If you're an aspiring artist, musician, designer or filmmaker, be sure check out PutItOn.com today -- you won't be disappointed! Check out their press release. EKC Client YOUNG HOLLYWOOD to be on the DAILY 10 TONIGHT @ 7:30!! Young Hollywood's *exclusive interview* with Scheana Marie (John Mayer's new "squeeze") will be aired on the Daily 10 TONIGHT @ 7pm!! EKC client Young Hollywood was also included in E! Online in an article dispelling the rumors on John and gal pal Scheana. Read the article: "John Mayer's Pal: Singer has no contact With Rumored New Gal-Pal"
Be sure to check out www.younghollywood.com for more celebrity interviews, videos and photos!